Imagine if a kangaroo couldn't jump. That's what happens to Little Joey who wakes up one day and can't remember how to bounce! The Little Joey Who Lost Her Bounce is a board book with flaps that explores the concept of bouncing as a movement. Apart from a kangaroo, just what else bounces? As Little Joey tries different ways to find her bounce, we get to see different objects that do: a variety of balls, a trampoline, springs, and even a big bouncy bed. Little Joey doesn't understand where her own bounce has gone, until she falls backwards and her tail helps her to jump back up (kangaroos use their tails to help them balance and bounce, of course). 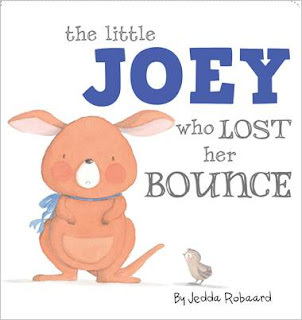 The Little Joey who Lost her Bounce is fun for the youngest of readers, and comes with cute pictures of Little Joey attempting to regain her bounce.